Katrina's Kreative Heart: Scraps! Scraps! Everywhere Scraps! Are you over-run by scrap cardstock? Do you hate to reach for your scraps when you need just a small piece? Do you find it just easier to cut another full size sheet rather than look through that pile just to find the right size and color? If your answer is “yes”, and I’m sure for many of you it is, then you have come to the right place! I have been there! Up until very recently that is. 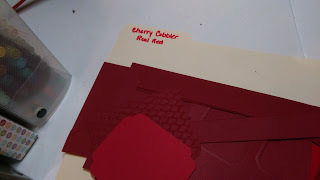 Now, I don’t claim to be a professional organizer, nor do I profess to be a great organizer, but I do keep trying new ideas until I find one that works for me, and finally I have found what works for me and I am now consistently reaching for my scraps to find what I need BEFORE I cut another full size piece of cardstock! I can’t tell you how many things I had tried that just didn’t work for me because it would be too numerous to count; just know that they did not work for me. You see, for my workflow, I need my supplies conveniently located and easily accessible and organized. If I need to paw around too much, that doesn’t work and only causes me stress and aggravation…no good for a crafter! Our crafting is supposed to bring relaxation and joy right? So I would just cut more cardstock and make MORE scraps to store. I couldn’t bear to throw away a perfectly good piece of cardstock but I would never use it because it was too hard to find or too time consuming to find it. Hence, my continued search for what would work for me. The best part…it is so simple it’s crazy! I just labeled the manila folders with the color names and I grouped “like” colors together, like Basic Black and Basic Gray with Smoky Slate in one. I did make a separate folder for Whisper White because I always have lots of white scraps. 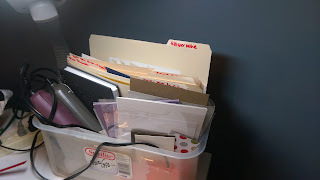 I placed all the folders standing up in a plastic “tote” and I can not tell you how well this has been working for me. I have been using this “system” for just over a month now and I am finally using up my scraps! It might look a little messy here because I was actually working when I took these shots, but now, when I need a ½ sheet or smaller, of whatever color I need, I pull the folder containing the color I need and quickly leaf through the scraps to see if there is a piece that I can use, and most of the time there is. I’m no longer wasting my cardstock and feel that I am getting much more value from it. So, if you too are struggling to find a convenient storage solution, give it a try. It’s inexpensive…I had everything laying around the office/craft room and I just repurposed them. If you give this a try, please leave me a comment and let me know how it’s working for you. In the meantime, Happy Stamping!